خرمی شاد, هادی, نصیری, سجاد. (1394). بررسی تاثیر عوامل هندسی و مادی تاثیرگذار بر استحکام اتصالات ترکیبی چسبی-پرچی. علوم و فناوری کامپوزیت, 2(2), 71-78. هادی خرمی شاد; سجاد نصیری. "بررسی تاثیر عوامل هندسی و مادی تاثیرگذار بر استحکام اتصالات ترکیبی چسبی-پرچی". علوم و فناوری کامپوزیت, 2, 2, 1394, 71-78. خرمی شاد, هادی, نصیری, سجاد. (1394). 'بررسی تاثیر عوامل هندسی و مادی تاثیرگذار بر استحکام اتصالات ترکیبی چسبی-پرچی', علوم و فناوری کامپوزیت, 2(2), pp. 71-78. خرمی شاد, هادی, نصیری, سجاد. بررسی تاثیر عوامل هندسی و مادی تاثیرگذار بر استحکام اتصالات ترکیبی چسبی-پرچی. علوم و فناوری کامپوزیت, 1394; 2(2): 71-78. 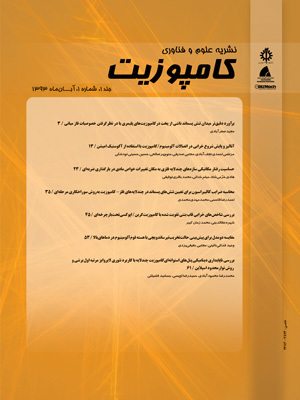 در این تحقیق، عوامل تاثیرگذار بر استحکام اتصال ترکیبی چسبی-پرچی مورد بررسی قرار گرفت. برای این منظور ابتدا مدل اجزای محدود با استفاده از نتایج آزمایشگاهی اعتبار‌سنجی شد، سپس عوامل تاثیرگذار هندسی و مادی با استفاده از تحلیل‌های اجزای محدود صریح با قابلیت مدل‌سازی آسیب در پرچ‌ها و لایه چسب به‌صورت پیش‌رونده بررسی شد. نتایج نشان دادند، در یک اتصال ترکیبی بهترین حالت برای ایجاد سوراخ به‌منظور قرار دادن پرچ، حالتی است که کمترین کاهش استحکام را در اتصال چسبی ایجاد نماید یا به عبارت دیگر سوراخ‌ها از لبه‌های اتصال فاصله بیشتری داشته باشند که این بر خلاف اتصال پرچی تنها می‌باشد که نزدیک‌تر بودن پرچ‌ها به لبه‌های اتصال موجب افزایش استحکام می‌شود. به‌طور کلی افزودن پرچ به یک اتصال چسبی به‌منظور ایجاد اتصال ترکیبی، می‌تواند تحت شرایط مختلف باعث افزایش یا کاهش استحکام اتصال شود که در این تحقیق مورد بررسی قرار گرفته است. این مطلب باید مورد توجه طراحان قرار گیرد. قابل ذکر است اگر استحکام لایه چسب در مقایسه با پرچ‌ها پایین‌تر باشد پرچ‌ها بهتر است در نزدیکی لبه‌های اتصال قرار گیرند. In this paper, the influencing factors on hybrid adhesive-riveted joints were investigated. For this purpose, first a finite element model was validated based on experimental results, then the effects of influencing material and geometrical factors on the strength of the hybrid joints were studied using the explicit finite element analyses. The numerical model was able to simulate damage in the adhesive layer and in the rivets. The results showed that in a hybrid adhesive-riveted joint, it is better to position the rivets where a minimum reduction in the adhesive joint due to the rivet holes obtained i.e. as far as possible from the joint ends. This is in contrary to the riveted joints in which placing the rivets closer to the joint ends resulted higher joint strength. In general, incorporating rivets in an adhesive joint for manufacturing a hybrid joint can result higher or lower joint strength in comparison with the adhesive joint in different conditions that were studied in this research. It should be noted that in case that a low-strength adhesive is utilized in a hybrid adhesive-riveted joint then placing the rivets closer to the joint ends can results higher strength for the joint similar to the riveted joints. Pereira, A. Ferreira, J. Antunes, F. and Bártolo, P., "Analysis of manufacturing parameters on the shear strength of aluminium adhesive single-lap joints," Journal of Materials Processing Technology, Vol. 210, pp. 610-617, 2010. Kahraman, R. Sunar, M. and Yilbas, B., "Influence of adhesive thickness and filler content on the mechanical performance of aluminum single-lap joints bonded with aluminum powder filled epoxy adhesive," Journal of materials processing technology, Vol. 205, pp. 183-189, 2008.
 da Silva, L. F. and Lopes, M. J. C., “Joint strength optimization by the mixed-adhesive technique”, International Journal of Adhesion and Adhesives, Vol. 29, No. 5, pp. 509-514, 2009. Ganesh, V. Choo, T., “Modulus graded composite adherends for single-lap bonded joints”, Journal of composite materials, Vol. 36, No. 14, pp. 1757-1767, 2002. Ashcroft, I. Wahab, M. A. Crocombe, A. Hughes, D. and Shaw, S., “The effect of environment on the fatigue of bonded composite joints. Part 1: testing and fractography”, Composites Part A: Applied Science and Manufacturing, Vol. 32, No. 1, pp. 45-58, 2001. Chaves, F. P. da Silva L. M. de Castro, P. T., “Adhesively bonded T-joints in polyvinyl chloride windows”, Proceedings of the Institution of Mechanical Engineers, Part L: Journal of Materials Design and Applications, Vol. 222, No. 3, pp. 159-174, 2008. Tsai M. and Morton, J., “The effect of a spew fillet on adhesive stress distributions in laminated composite single-lap joints”, Composite structures, Vol. 32, No. 1, pp. 123-131, 1995. Sadowski, T. Kneć, M. and Golewski, P., “Experimental investigations and numerical modelling of steel adhesive joints reinforced by rivets”, International Journal of Adhesion and Adhesives, Vol. 30, No. 5, pp. 338-346, 2010. Khoramishad, H. Crocombe, A. Katnam, K. and Ashcroft I., “Predicting fatigue damage in adhesively bonded joints using a cohesive zone model”, International Journal of fatigue, Vol. 32, No. 7, pp. 1146-1158, 2010. Sadowski, T. and Zarzeka-Raczkowska, E., “Hybrid Adhesive Bonded and Riveted Joints–Influence of Rivet Geometrical Layout on Strength of Joints”, Archives of Metallurgy and Materials, Vol. 57, No. 4, pp. 1127-1135, 2012.